Since publishing my series of posts on manipulating shapefiles in Python (1, 2 and 3), I’ve been exploring different open data catalogs so I thought I’d share some of the maps I’ve mapped! All these were produced using scripts in my learning_shapefiles repository on GitHub (see denver_stack.py and denver_tree_canopy.py). MapZen is a pretty sweet service! You can draw a regional box then the folks at MapZen will take that box and extract all the OpenStreetMap data within the box then give you the shapefiles with all that info. First thing I (stupidly) did after downloading my data extraction from MapZen was to just plot all of the shapes… and I then proceeded to sit around for quite some time while my laptop chugged away and produced a highly detailed map of all the things in Denver County. I zoomed in to downtown Denver for the above image to show off the detail. 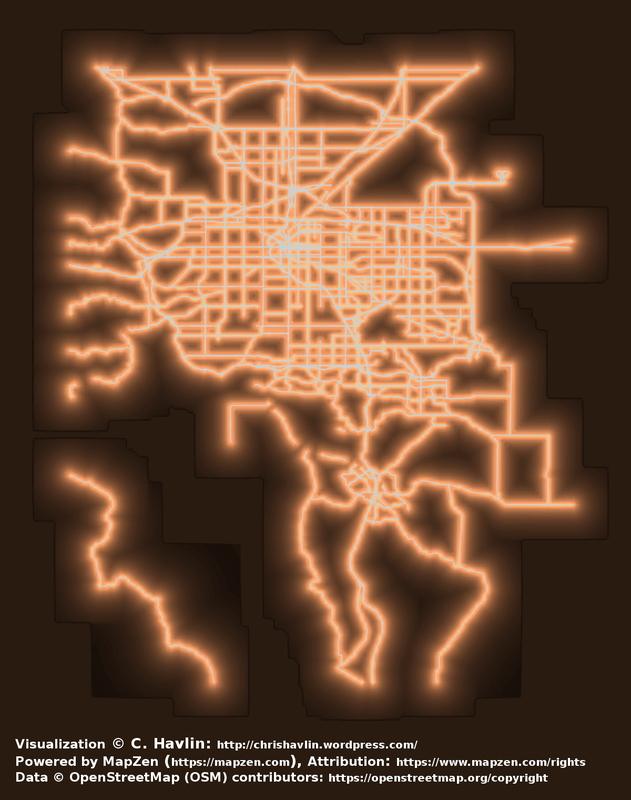 A more abstract representation of the primary roadways in metro Denver. I figured out how the MapZen/OpenStreetMap shapefile was organized and only plotted motorways, primary and secondary roads (bright white in the map). I also created a grid containing the shortest distance to a roadway (using the distance method available for shapely.geometry.LineString) and contoured the inverse distance (1/x) to evoke the topographic contours along rivers. Denver’s Open Data Catalog has a bunch of databases with shapefiles galore. I downloaded one for the Tree Canopy and then plotted up the percent tree cover in each geometry. This is what actually lead me to learn how to plot roadways… and here I overlaid the tree cover on the same MapZen extraction of OpenStreeMap data. Along with the roadways underneath, it forms a sort of abstract tree. So that’s it for today. 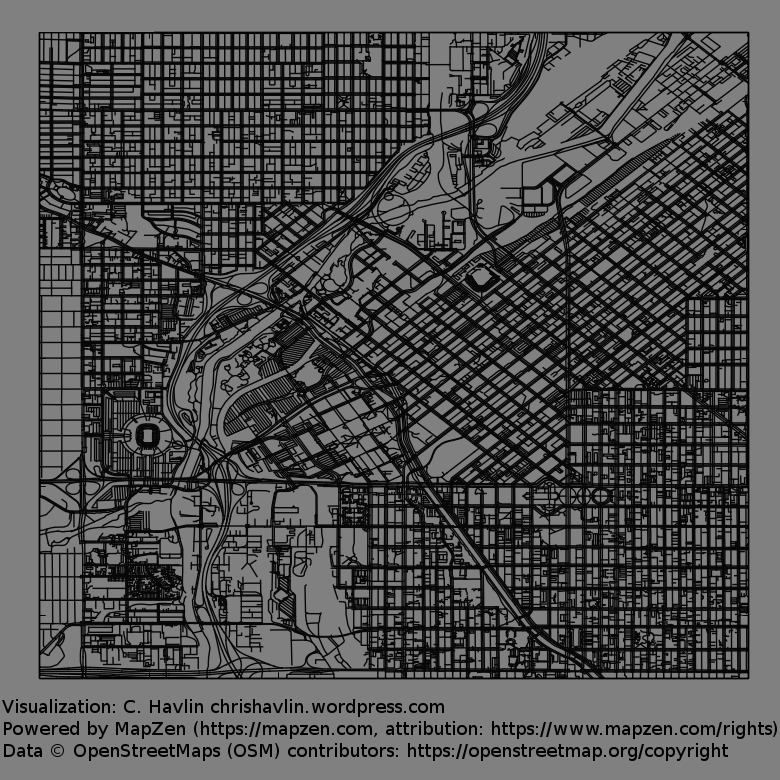 Three maps from a couple different open data sources using some inefficient Python. Not going to go into detail on the code this time, because, well, it’s slooow. I’m using modifications of the simple scripts that I used in my shapefile tutorials because I was excited to just plot things! But there are much better ways to handle shapefiles with hundreds of thousands of geometries. So until next time (after I figure out how to use fiona or geopandas), just enjoy the visuals!